Timely and skilled air conditioning parts and services are critical during Miami's sweltering heat. Is your AC unit barely making it along, not cooling your house or business? Has the time finally come to repair your AC unit before it completely breaks down? If so, Felco Air Conditioning Miami promises to promptly and efficiently address your air conditioning parts and repair needs. Your complete satisfaction is guaranteed. Just call us at 305-221-4471 and we'll take care of all your residential and commercial air conditioning parts, repairs and services. Air conditioning products and services that exceed all commercial grade quality standards. Repairs are done to achieve the highest level of personal comfort with the lowest possible energy consumption. Repair or replacement of the AC compressor, evaporator coil, heat pump, duct system and other system components as needed. Planned Preventive Maintenance Agreements are available and recommended to avoid breakdowns and to extend the life of your system. Whether it's your home or your business, the most important way to avoid costly and unexpected air conditioning repair bills is to maintain your system on a regular basis. Planned Preventive air conditioning system maintenance check-ups are a very cost-effective way to help prevent system downtime, help maintain an energy efficient unit, reduce your equipment costs and lower your energy bills. Let us tell you how we can help you achieve and preserve a well-maintained AC system. 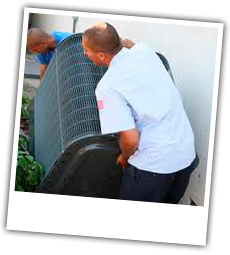 All our technicians are trained and experienced in both residential air conditioning Miami and commercial air conditioning Miami system repair and maintenance. Felco Air Miami technicians are qualified to repair and maintain all models of residential and commercial AC units Miami.